It starts with recount of Rosa Parks, how she refused one day to give up her seat to a white man in a bus and the events that ensued and became a puzzle pieces in abolishing segregation in the US. 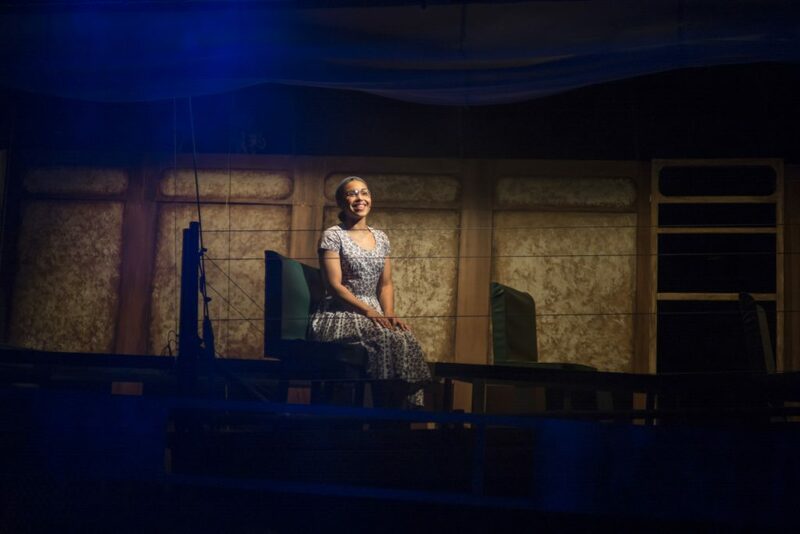 “Blowin in the wind” at Chickenshed is a series of musical scenes, where the company addresses several social justice causes during the 20th century. Each issue is conveyed by a song from the 60ies. Rosa Parks becomes our guide on a journey that hopes to eventually arrive to “I have a Dream” speech at Washington DC. Rosa Parks sits on a bus above the stage in bus that goes to Washington DC for Martin Luther Kings’s Speech “I have a Dream”. Sadly, there is no actual story, but the musical numbers are stitched together to make up an entertaining picture. It changes from solos to chorus to choreography in a way that does not let you lose concentration. 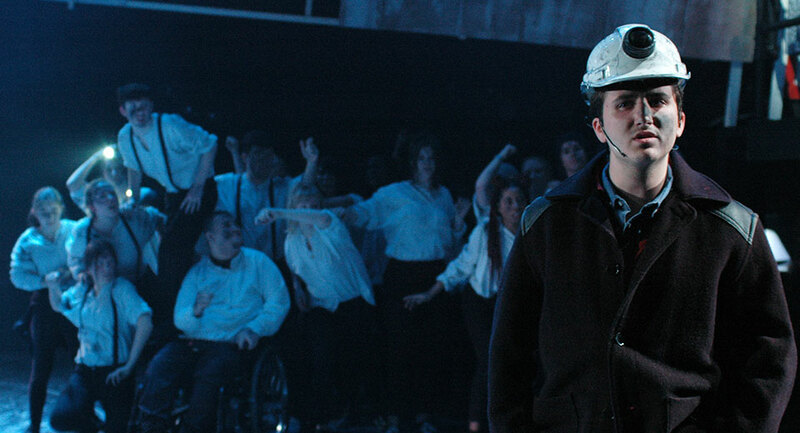 Voices are good, choreography – the best I’ve seen in Chickenshed since I started following it two years ago. 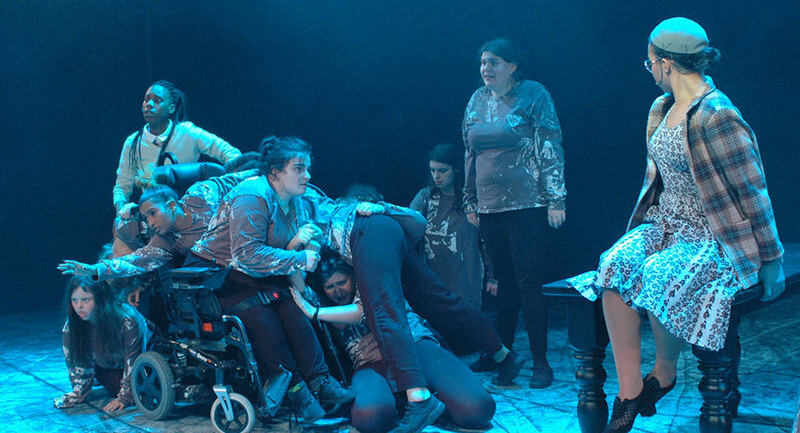 They manage to mix wheelchair and walking dancers in a way that both identifies them in their unique way and at the same dime deconstructs the differences for common purpose. How to handle a conversation without guilt-tripping half of your audience, without shaming anyone based on their backgrounds? How to address nuance and complexity in a world that is increasingly complex? Chickenshed has an answer. Their honest commitment is inspirational. They always handle social justice in the sanest way imaginable, which is highly refreshing in the age of Internet outrage, when posting infuriated comments online and perpetuating “trigger warning” culture is considered “being on the right side of the history”. The musical does not stop at race issues. I was happy to see a sequence devoted to the miners’ strikes of 1984 because financially poor white men are often one of the most disenfranchised group of the society. It was also great they picked up “Mothers of Plaza de Mayo” of Argentina. Both cases do not receive much coverage these days. Nor do they make a great buzzword or celebrity virtue signalling can be done here to make their plight listened. So much pain passes unnoticed. Admired symbolic figures, like Rosa Parks or Azucena Villaflor of Mothers of Plaza de Mayo are purely incidental. These people are only common, private persons that human ocean has delivered to be seen on the briskly shore of recognition. Others were not so lucky – and perished, unacknowledged. Human attention is easily swayed, it needs a story, a relatable character to empathise with the cause. In the eyes of the public social justice figures become more of a symbol than a person. Rosa Parks died venerated, symbolic at the age of 92, but should the circumstances collided differently and she have lost – and no-one would have remembered her, she would be crushed by the system – like the character from the next sequence of the musical: Hattie Carroll form “The lonesome death of Hattie Carroll” by Bob Dylan. Rosa Park’s bus goes nowhere – she tells us that its destination is Washington DC to hear Martin Luther King’s speech, but we never see her listening to this speech again. This gathering becomes more a symbol than a destination, a moment of lucidity a breaking point in the national history. 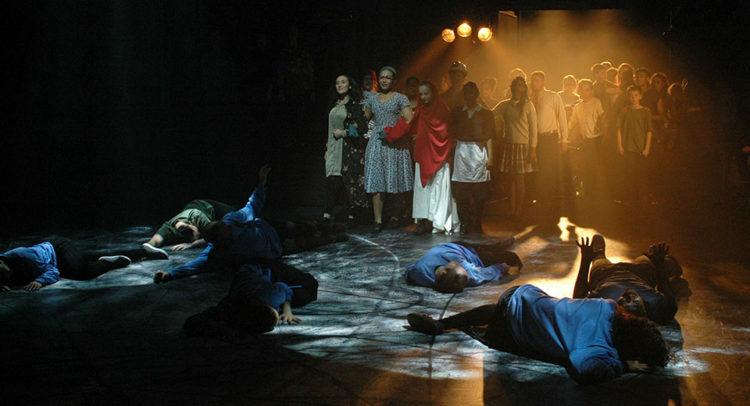 In the musical it represents a perfect moment of purification through realisation, not through violence. This time it has to be different, another moment of lucidity, another revelation. Which one? A Syrian boy washed on a Turkish shore? An MP dead? Time will tell. Photos are courtesy of Chickenshed. Blowin in the Wind is showing until 02 April.